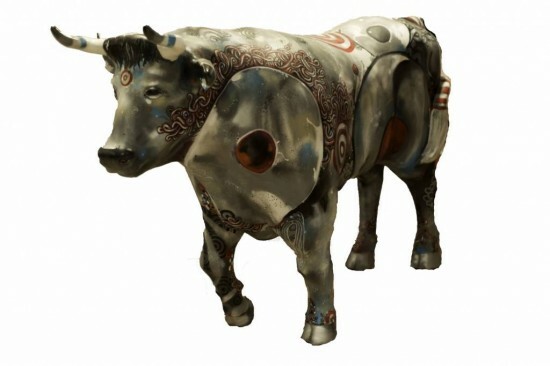 I chose the title/theme Bull’s Eye as a play on the similarities between an Ox and a Bull. The Bull’s Eye is a pattern focal point amid a myriad tapestry of texture and decoration that came to mind immediately mostly for aesthetics’ sake. Though, one could draw conclusions of the intended message being about the relationship between man and beast, whether for food or game, seeing the creature as a target. Much of my work focuses on fusing ancient cultural patterns and graffiti stylizations, bringing antiquity and contemporary together. Both styles represent the art of the people on accessible everyday cultural levels as does public art and this project in particular. Celtic knots and tribal patterns would tattoo this ox in subtle and vibrant varieties. For this project the palette of Chinese landscapes with bold hints of bright red came to mind. I used a grey scale playing with hue and value separations and crimson reds for my Ox. The solid warm color on washed cool greys will create a stark contrast and should jump out at the viewer. The mediums used are aerosol (spray paint) and exterior enamel (house paint). As an artist and local resident I’d like to thank the Council for this initiative and opportunity. Public art on a street level is a meaningful way to inspire the community and create wonder and excitement in the hearts of people, especially children.